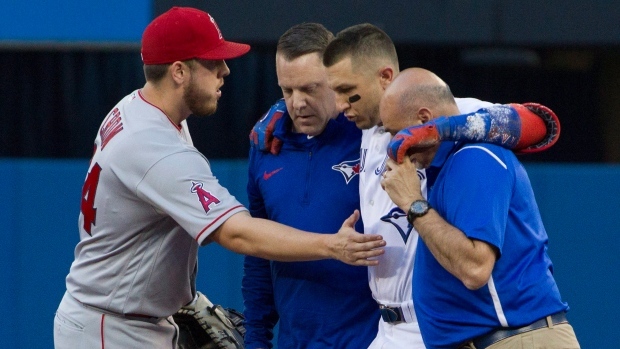 Troy Tulowitzki has been placed on the 10-day disabled list after leaving Friday's game in the third inning, according to TSN's Scott Mitchell. The Blue Jays' shortstop rolled his right ankle while running to first base on a ground ball. He appeared to have stepped on the foot of first baseman C.J. Cron while stretching for the bag. He went down and grabbed his right ankle immediately before exiting the game with help from the training staff. Tulowitzki will be heading for an MRI on Saturday. The five-time All-Star was diagnosed with a sprained ankle. John Gibbons is expecting Tulowitzki to miss a significant chunk of time: "It didn't look good." In a corresponding move, utility man Rob Refsnyder has been called up from the Buffalo Bisons. Refsnyder was traded to the Blue Jays from the New York Yankees on July 23. However, the utility man will not be in the line-up on Saturday as he was held up at the border. The 32-year-old Tulowitzki entered play Friday hitting .250 with seven home runs and 26 RBI. Tulowitzki has missed a combined 66 games in 2015 and 2016, and has missed 37 games this year. Ryan Goins will get the majority of the playing time at shortstop with Darwin Barney mixing in.